During the four-day camp, students investigated — and then created their own - mock crime scenes in the CSI House on campus conducted lab work on various types of evidence (hairs, fibers, fingerprints, etc.). They also heard presentations from faculty in the Department of Criminal Justice and Intelligence Studies on subjects ranging from criminal justice and intelligence and national security to Ninja fighting and forensic entomology. "This was a group of extremely bright students and advanced learners," remarked Edward Strimlan, M.D., assistant professor and coordinator of the forensic science program. "It was exciting to have a lot of out-of-town students again this year," added Strimlan. 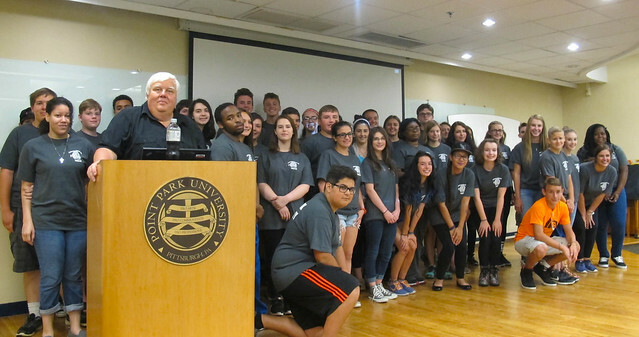 Students came to the CSI camp from across Pennsylvania as well as nine other states including Connecticut, Illinois, Indiana, Maryland, New Jersey, Rhode Island, Tennessee, Texas and West Virginia. "I decided to come to this camp because I've been interested in forensics for a while and wanted to see if this might be something I want to do in the future," said Ryan Coyne, a sophomore from Seneca Valley High School in Harmony, Pa.
Naomi Lance, a junior at Oakland Catholic High School in Pittsburgh, is interested in being a lawyer and chose to come to CSI camp to learn about how forensic science ties into the legal field. "My favorite part was doing the mock courtroom trial with Professor Avery," said Lance. "It was also very interesting to see Dr. Strimlan's photos from real-life crime scene investigations." Rob Cochrane, a sophomore from Tipton High School in Tipton, Ind., discovered Point Park's CSI summer camp through a Google search. "A lot of well-known forensic scientists came from Pittsburgh so I figured this would be a good place to learn about the CSI field," said Cochrane. "I found listening to stories from the different professors and learning from their work experiences to be the most beneficial part of the camp," he added. Several Point Park forensic science majors volunteered their time to lead various group activities. One of those students was Sarah Lukaszewicz, a sophomore at Point Park. "I'm an aspiring forensic investigator so it was great to serve as a guide to high school students who are interested in forensic science and related fields," remarked Lukaszewicz. Jordan Cook-Henry, also a sophomore at Point Park, said: "I decided to help out so I could give high school students a college student's perspective on studying forensic science." "By the end of the week, the students had built some great crime scenes," added Cook-Henry, who would like to work in pathology or forensic investigations after graduation. "I enjoyed helping out the students and watching how much they learned and improved over the course of the week," explained sophomore Sarah Berardelli, whose career goal is to work in a lab on DNA and fingerprint analysis. "It was also great to see the students make new friends." Leanna Brooks, a senior forensic science and biology double major, loves teaching students the basics of crime scene investigations and helping them decide if they want to be forensic scientists. "Seeing the students' enthusiasm has been really rewarding," said Brooks, who plans to pursue the forensic science subfield of serology after graduation. For the conclusion of CSI camp, the high school students watched a video of a real autopsy being performed, gave group presentations on crime scene scenarios and then participated in an awards ceremony. "It was great to see so many parents in attendance for the presentations and awards ceremony," said Strimlan. For the future, Strimlan is considering designing a "CSI Camp 2.0" and inviting high school students back to campus to advance their knowledge about forensic science.